Hallmark’s got sections for several different kinds of graduations, from pre-K and elementary school to high school and college, but there’s still one area in which they’re sorely lacking: graduation cards for dogs, specifically Police K9s. Case in point: WPI’s own campus K9, Bella, just recently returned from completing her latest round of training at the Bureau of Alcohol, Tobacco, Firearms, and Explosives (ATF) National K9 Training Facility in Virginia. Lavallee and Bella at the ATF training facility in Virginia. Back in September, Lavallee and Bella received an invitation to travel with fellow officers and K9s from Everett, Somerville, Salem, Methuen, Cambridge, the Massachusetts State Police, Park Service, and Environmental Police to participate in a week of training designed to further her expertise in keeping the WPI campus community safe. The training, which Lavallee describes as Bella’s own version of theory and practice, took her back to the basics of her job with a refresher course on scent imprinting before building upon those skills through operational scenarios. She trains with Lavallee daily and participates in in-service training every three months, but as Lavallee explains, it’s important for them to work with other instructors and trainers, some of whom have 25 to 30 years of experience, to see what else can be learned. "It's a real sense of pride." Throughout the week, Lavallee and Bella perfected their detection skills in several different scenarios and operational environments, ranging from searching the first floor of a building for suspicious materials following an active shooter drill and recognizing large amounts of explosive materials, to determining the location of a hidden firearm or explosive a suspect might have concealed in a housing complex. The week was just as much a training for the officers as it was for the K9s. They practiced recognizing the changes in behavior of their dogs as they patrolled the areas (Lavallee explains that Bella’s posture and breathing are vastly different depending on what she finds), and also participated in K9 first aid training, where they learned how to apply a tourniquet to their dogs to stop bleeding in the event of a shooting, administer NARCAN on them, and more. While the hope is that none of what Bella and Lavallee learned at the training will have to be applied to a situation on campus, it’s still invaluable to have in order to keep the campus safer and contribute to a more secure environment. 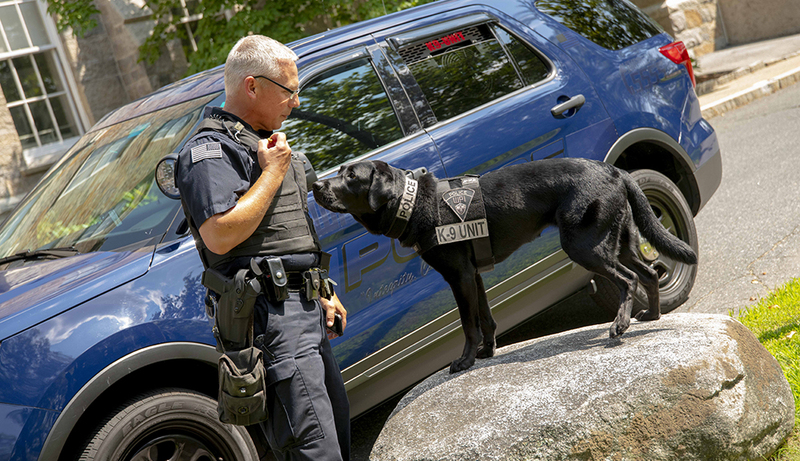 Surprising exactly no one on campus, Bella was a big hit with the ATF trainers; they commended not only her temperament, but her talents—citing the forward thinking of WPI to have a dedicated explosive-detection dog on their campus police force.